WASHINGTON -- President Donald Trump proposed dramatic cuts in corporate and personal taxes Wednesday in an overhaul his administration asserts will spur national economic growth and bring jobs and prosperity to America's middle class. But his ambitious plan is alarming lawmakers who worry it will balloon federal deficits. 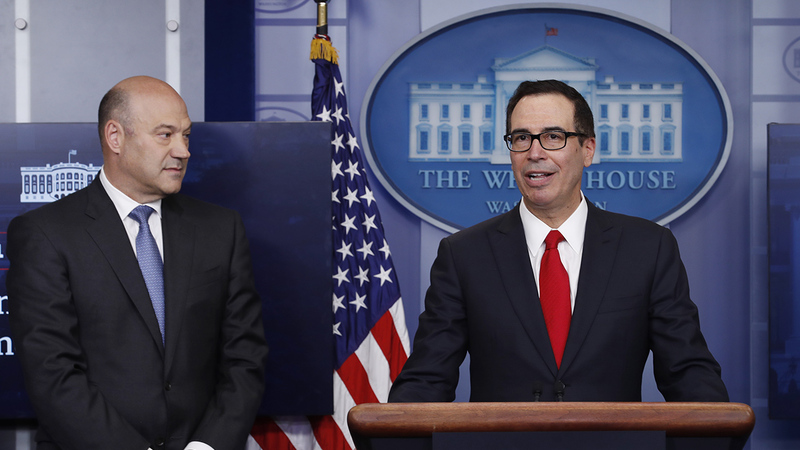 The White House has yet to spell out how much of a hole the tax cuts could create in the federal budget, maintaining that the resulting economic growth would eliminate the risk of a soaring government deficit- if not actually cause the red ink to diminish. On the corporate side, the top marginal tax rate would fall from 35 percent to 15 percent. Small businesses that account for their owners' personal incomes would see their top tax rate go from 39.6 percent to the proposed corporate tax rate of 15 percent. Mnuchin said the change for small business owners - a group that under the current definition could include doctors, lawyers and even major real estate companies - would be done in a way that would ensure wealthier Americans could not exploit the change to pay less than intentioned in taxes.